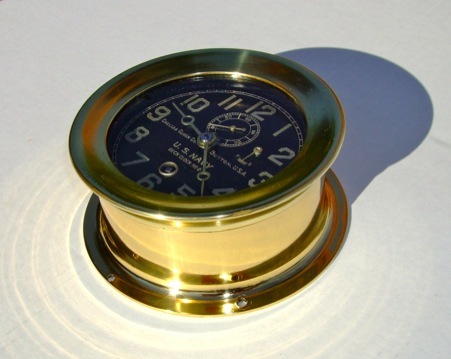 This is a Circa 1930 Chelsea Navy Deck Clock. It arrived in non-working condition and looking simply horrible. The cast brass was pitted from years of salt exposure. 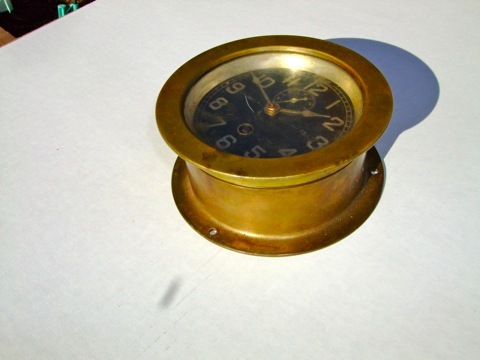 The dial was corroded and dull-looking. Decades of neglect had left the movement completely frozen and inoperative. I began by disassembling the movement and hand cleaning each part to remove rust, old oils and greases that had turned into green sludge and then giving the movement a thorough ultrasonic cleaning. The delicate single-roller escapement was carefully taken apart and inspected for wear and cleaned. 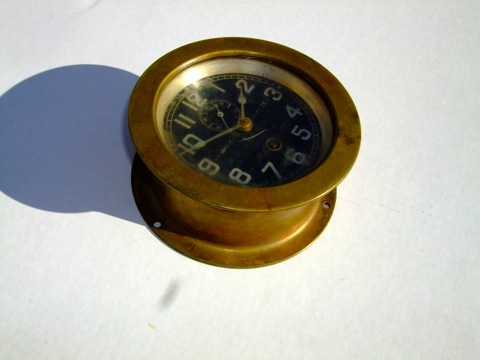 The case, reflector, dial, hands and bezel provided their own challenges as decades of corrosion had to be removed. This was done using three polishing machines, four wheels, five compounds and a lot of hand finish-polishing to bring back the shine and depth of the brass. The hands were hand polished as were the hand washer and screw. The reflector was refinished. After thorough polishing and cleaning, the case and bezel were coated with Würth German hard lacquer which was then hardened with UV light. New glass was fitted to replace the ugly, yellowed plastic. 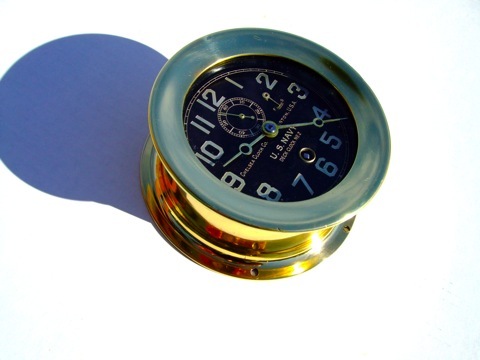 This clock came back from its former condition to live again in glorious, shining splendor. Years of corrosion had to be carefully removed and the movement had to be restored to running condition. Refinished inside and out, running again and keeping time to better than original Chelsea specification.